Herkimer Diamonds are incredibly beautiful double-terminated water clear quartz crystals which are found mainly in Herkimer County, New York. The crystals themselves are works of nature found in dolomite rock, a type of limestone that dates around 500 million years old. They require no cutting to achieve their sparkling appearance. Some of the crystals contain liquid inclusions or inclusions of a coal-like substance called anthraxolite. 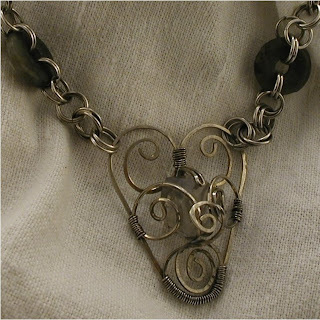 I have showcased one in the silver wire necklace shown here. The beauty of a high grade Herkimer diamond rivals that of a diamond and many people prefer them to the cut stone. They are highly prized by jewelers and mineral collectors. Herkimer diamonds are also used for their metaphysical properties. They are said to assist with balance on the mental, emotional and physical levels. They are professed to relieve tension and thereby promote peace of mind. Herkimer Diamond is associated with the crown chakra. You can mine Herkimer diamonds for yourself in Herkimer county New York. There are 2 mines open to the public the Herkimer Diamond Mines and the Ace of Diamonds mine. I have tried this process myself and found it to be very hard work. We did not find any crystals large enough for jewelry on our trip but the small crystal bits that we located gave us an idea of the mining process.